With a stay at Airy Riau Progo 6 Bandung in Bandung (Bandung Wetan), you'll be within a 10-minute walk of Gedung Sate and Riau Street Factory Outlets. Featured amenities include a 24-hour front desk and an elevator (lift). With a stay at Airy Nusa Dua 1 Kuta Selatan Bali in Nusa Dua (Kuta Selatan), you'll be within a 15-minute drive of Nusa Dua Beach and Udayana University. 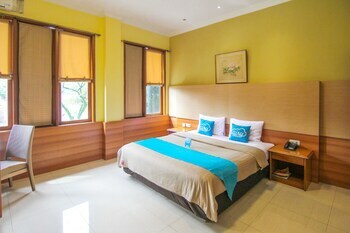 Located in Bandung, Airy Sukasari Setrasari Raya 10 Bandung is a 5-minute drive from Barli Museum and 8 minutes from Indonesia University of Education.